Performers include: Hugh Beaumont, Barbara Billingsley, Tony Dow, and Jerry Mathers, as well as Pamela Baird, Frank Bank, Diane Brewster, Richard Correll, Richard Deacon, Stanley Fafara, Tiger Fafara, Buddy Hart, Cheryl Holdridge, Burt Mustin, Ken Osmond, Sue Randall, Rusty Stevens, Stephen Talbot, and Jeri Weil. Series Description: The gentle sitcom focuses on the Cleaver family in the fictional small town of Mayfield. The younger of the family’s two boys, Theodore (nicknamed “Beaver”, played by Jerry Mathers) was a typical all-American little boy who had a knack of getting himself into trouble. 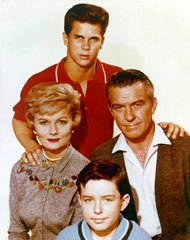 His older brother Wally (Tony Dow) and parents June and Ward (Barbara Billingsley and Hugh Beaumont) did their best to guide him through his childhood. First aired: June 20, 1963. A made-for-TV movie entitled Still the Beaver reunited most of the surviving cast in 1982. The most notable absence was Beaumont who had died in 1982 but the reunion included several clips of him from the original series. The reunion movie inspired a new television series of the same name for the Disney Channel and featured Bank, Billingsley, Dow, Mathers, and Osmond. It was cancelled after one season but was renamed The New Leave It to Beaver and continued until 1999 in first-run syndication. A feature film remake was released in 1997 with a new cast. It was not a box office success but Bank, Billingsley, and Osmond made cameos. • The last episode was directed by Beaumont. • The series ran for one season on CBS before being cancelled. ABC picked it up and ran it for five more years. The series was never a top-rated show. • The Cleavers’ second house (they moved to a different home in Mayfield in season three) is actually a facade and can be found on the Universal Studios backlot in California. It was been changed many times over the years but was restored (mostly) for the reunion movie. When the revival series’ production was moved to Florida in 1988, the interior sets made the trip but the facade did not. The house still exists at Universal but has since been moved. It is still visible on what is now known as Desperate Housewives’ Wisteria Lane. The replica house that was made for the 1997 Beaver movie is also on the same street. • The series was created by Bob Mosher and Joe Connelly who worked on the Amos and Andy radio show together in the 1940s. The two later created The Munsters. • Leave It to Beaver was initially going to be called Wally and Beaver but the show’s sponsor thought it sounded like a nature show and asked for the change. Wally was supposedly modeled after Connelly’s oldest son Jay while Beaver was based on his eight-year-old son Ricky.